In celebration of their ALMOST 1 year anniversary, we want to focus our spotlight on this precious couple featured for this week! This rustic/chic theme was the perfect combination of light and dark hues including gorgeous navy aspects with touches of blush to bring sweet sweet elegance. Their incredible cake provided by Barnett Estates included FOUR different flavors, yes you heard right, FOUR! Red Velvet, White Caramel, Cookies n’ Cream, & Maple Bacon. I don’t know about you, but I would of tried them all! Their wedding day was gushing with bright floral consisting of a variety of eucalyptus, tulips, daisies, snap dragons and lilies. Quite a combination, am I right? Following was the perfect reception including the greatest father/daughter choreographed dance ever, BBQ, Cake, and a Cookies & Milk bar. A little backstory: Tasha & Dotun met at a summer internship in Downtown Dallas, their first date was at BJ’s Restaurant and then took a trip up to the top of Reunion Tower. They have been together for 5 years now and have a sweet puppy named Kai. One of our FAVORITE questions is of course, how did he pop the question? 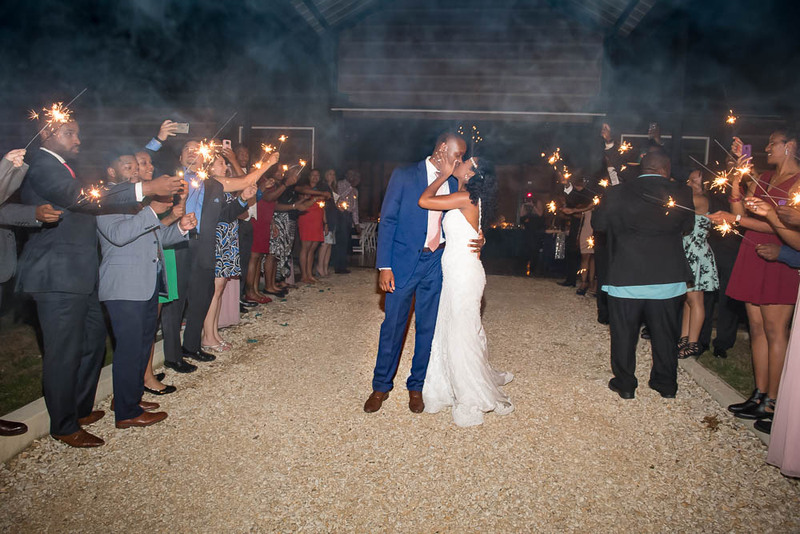 Following their breathtaking day here with us, they spent their Honeymoon in Miami and then headed out to Costa Rica! It was such a pleasure sharing this day with them and we can’t wait to watch their love grow. Thank you both for becoming a part of the Barnett Family, many warm wishes.